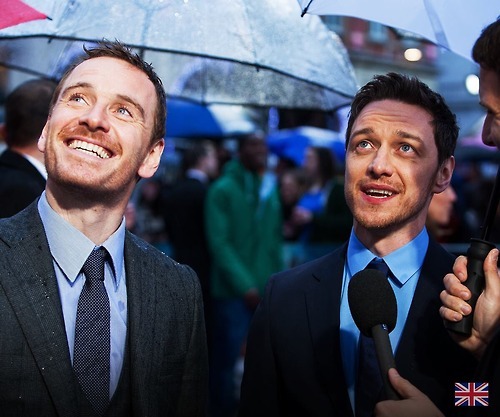 X-Men: Days of Future Past - लंडन Premiere. . Wallpaper and background images in the James McAvoy and Michael Fassbender club tagged: photo james mcavoy michael fassbender x-men days of future past london premiere 2014. This James McAvoy and Michael Fassbender photo contains बिजनेस सूट. There might also be सूट, कपड़े का सूट, ड्रेस सूट, पूरी पोशाक, tailcoat, पूंछ कोट, पूंछ, सफेद टाई, सफेद टाई और पूंछ, पोशाक सूट, पूर्ण पोशाक, टेलकोट, पूँछ कोट, पट, छत्र, चंदवा, पारासोल, and सनशाइड.